Sick of spending Independence Day stuck with your drunken friends of friends’ friends? Why not change it up this year and experience the symbolic rockets’ red glare and bombs bursting mid-air atop a mountain with a select handful of people whose company you actually enjoy? William Keith: People around Culver City love the stairs at Baldwin Hills Scenic Overlook but you’ll find like 200 cars and 600 people there. 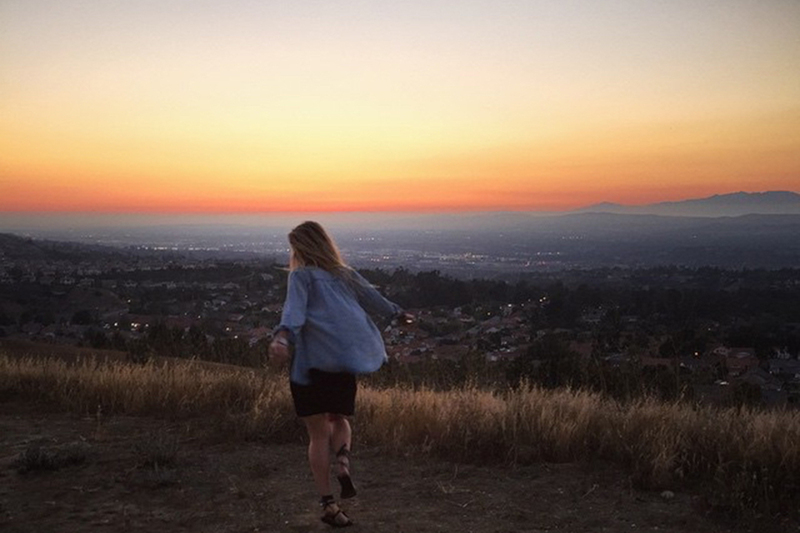 However, if you go just a mile away to the Kenneth Hahn State Park, there’s nobody there. Here you’ll have views from Santa Monica all the way to south of the airport and everything in between. I’ve literally watched four fireworks shows simultaneously here. Tip: You can enter at 4100 S. La Cienega Blvd but watch for time restrictions on parking here at night. Check the parking times and if it’s closing, head to Don Lorenzo Place on the other side of the park and park here. Then enter Kenneth Hahn Park on foot at the Don Lorenzo Drive entry and walk across the park to the gazebo this way. It’s a longer hike at around 1.6 miles, but it will save you getting a parking ticket. WK: Head north up PCH till just after Will Rogers State Beach and turn off at Sunset Blvd. Then turn left onto Los Liones Drive. Go to the end and you’ll find the Los Liones Canyon trailhead. It’s only about 2 miles until you reach the intersection with the Paseo Miramar Trail but you don’t need to go all the way to the top of Paseo Miramar. In fact, at the top, the view is restricted. On a hot July night it’s perfect up here. You have the coolness of the ocean breeze and this completely unobstructed view of the ‘rockets’ red glare.’ It’s very cool. You’ll find that you have an unobstructed view of the entire coast, all the way down past Hermosa Beach. You’ll get all of the fireworks shows from Santa Monica, Venice, Hermosa, Manhattan and even some of the inland ones. Tip: Ideally don’t hike much further than about 30 minutes past where the trails intersect as the view is the most perfect in this stretch. And don’t assume you can drive up because the Paseo Miramar Trail is a road. There’s no parking up there and you’ll get a ticket. This place is always open at night. WK: North of Granada Hills in the Mission Peaks district, you’ll want to find the Dr. Mario DeCampos trailhead which comes off Neon Way. Park here and walk up Sulphur Spring Fire Road for about two miles to a place called Top of O’Melveny. 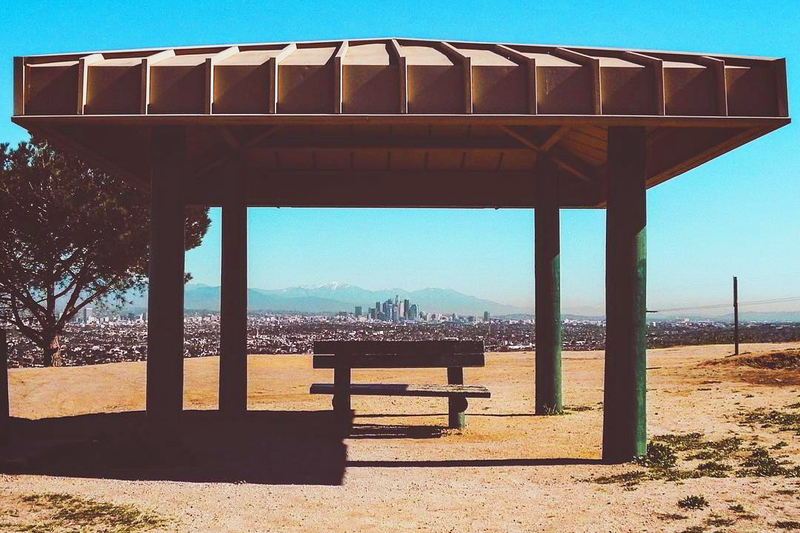 Here, you’ll find unobstructed views from Canoga Park all the way to Tarzana and everything in between. It can get a little foggy sometimes but the last few years have been fine. Tip: This is actually a very easy hike and great for families. This one is always open at night. WK: North of Hidden Hills off the 101 freeway, take Vanowen Street all the way west until it becomes Sunset Ridge Court. Here at this intersection is the trailhead. I just park around here. There are two routes for this one. One is just straight up, about 15 - 20 minutes for a healthy person. But if you’re not in a rush, head up the El Escorpion trail to a place called Cave of the Munits (it’s actually there on Google maps). You walk into the Munit cave front door and literally walk out of the chimney and up to the top of the ridge. There you’ll see the trail, then go right to Castle Peak. Here you’ll find unobstructed views all the way down the valley to Burbank. Tip: Since it’s a peak with rock formations you’ll have instant access to built-in seats. Bring a seating pad and sit down and enjoy the festivities. This one’s for go-getters so not a good hike for older people or kids. 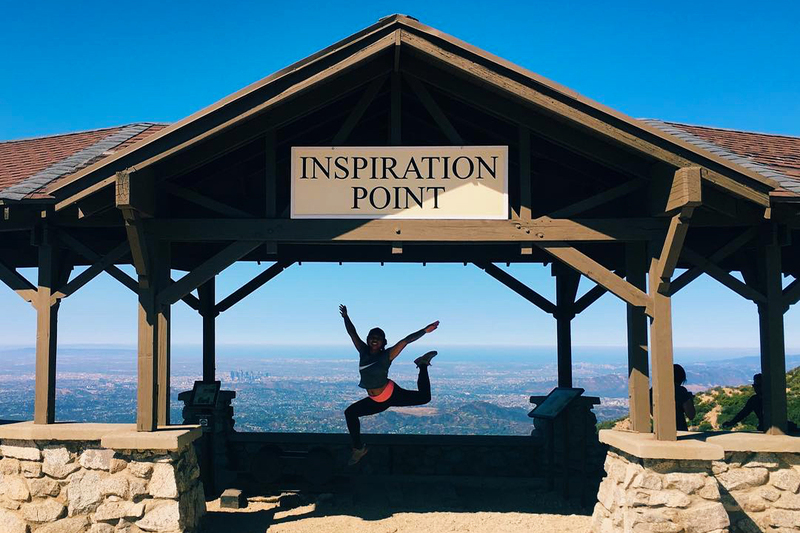 It’s hard to get up that peak unless you’re fit. Do double check night restrictions here before you go as upper Los Virgenes Canyon may have restrictions. 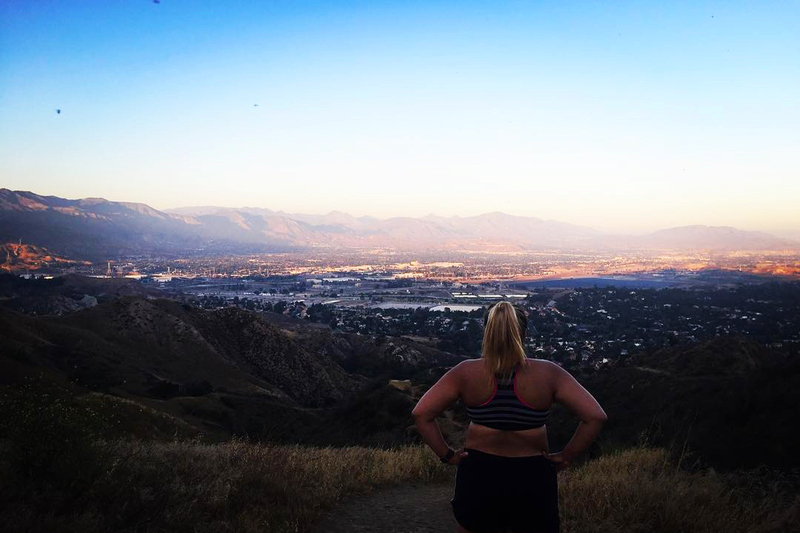 WK: This one’s the longest hike—which means no one will be there! Start at Lake Avenue, north of the 210 freeway, where it meets East Loma Alta Drive. It’s called Sam Merrill Trailhead. Now, this is a little over four miles (one way) so not for the faint of heart; but you’re going to have it all to yourselves. 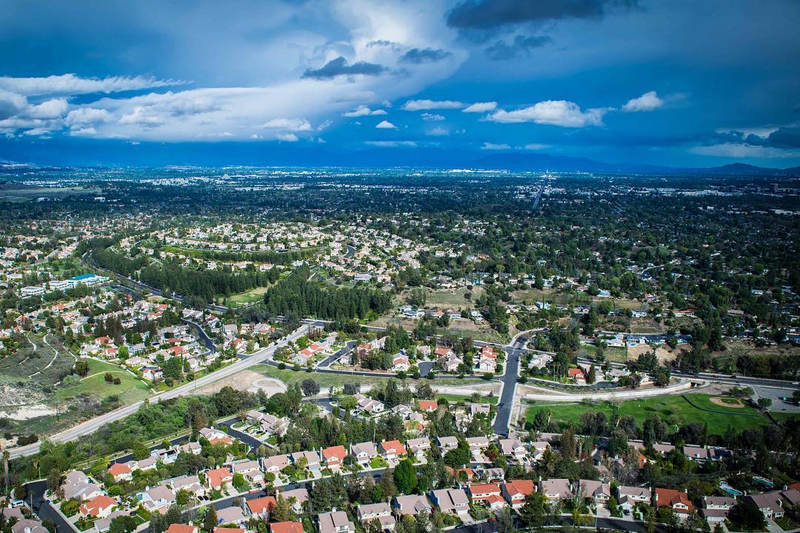 Here you’ll find unobstructed views between Glendale and Arcadia and across Pasadena. Tip: I actually met some of my best friends on a random night hike here. If you do meet people along the way, you’ll probably find if they’re up here too, they’re incredibly like-minded. WK: From Sunset Blvd head up Mandeville Canyon Road and turn left onto Westridge Road. Drive all the way up until —it will become West Mandeville Fire Road — and then where the fire road meets the dirt part of Mulholland Drive is San Vicente Mountain Park, a former Nike Missile Radar/Control Site in the 70s. If the gate is open, you can drive all the way onto Mulholland Drive. If not, just walk up the rest of the fire road. Tip: At the former missile site there’s still a tower so you can climb up the ladder and chill out. Open for night hikes. WK: Get off the 91 freeway at the Imperial Hwy/Cannon Street exit heading south. You’ll turn left when you hit Serrano Avenue. Follow Serrano until you see Hidden Canyon Road on your right. Then follow that until you hit East Avenida de Santiago on your right. It will become Edition Ridge. You’ll see a trailhead called Robber’s Roost before Edition Ridge ends. This is a very short hike but you will have views all over the northern OC. I used to go to school down here and that’s how I know about it. In high school, we all used to make out and watch the fireworks here. Tip: At 9:30 p.m. every evening you can view the Disneyland firework show from here. Obviously, this is extra spectacular on 4th of July. Open for night hikes. Most hikes are open after sunset on the above list, but if a park ranger stops you, just be cool. Tell them what you’re up to and most likely they will be more than fine to allow you to continue. “They don’t tend to ever mess around with you on the fourth of July; they know you want to have fun,” says William. Don’t smoke, be it tobacco or the green stuff. No matter how tempting it may be, if a park ranger gets a whiff of it, it’s a steep fine—as in, your monthly rent steep. Bring a flashlight and water. The sun may have gone down, but being dehydrated is never fun. Longtime outfitter supplies outdoor apparel, camping equipment & travel gear in a relaxed interior. Castle Peak is a mountain in California's Sierra Nevada near I-80, Donner Pass, and the Nevada border. It is in the Tahoe National Forest not far off the Pacific Crest Trail, and adjacent to Castle Pass. 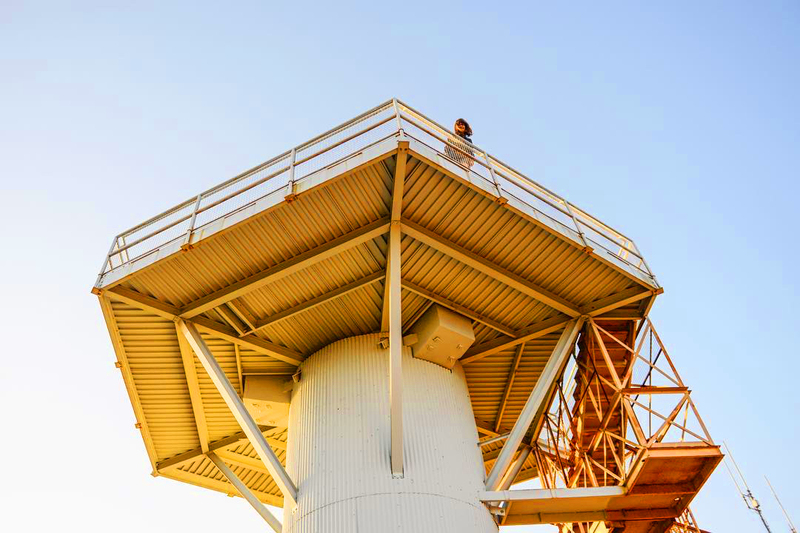 Scenic former missile launch site with a radar tower plus hiking, biking & horseback riding trails. Robbers Roost is a rock formation in the foothills of the Scodie Mountains portion of the Southern Sierra Nevada Mountain Range in the North Mojave Desert. The formation overlooks the southern portion of the Indian Wells Valley.